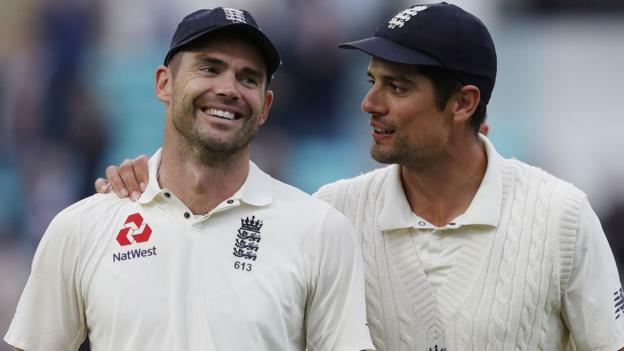 Record-breaking fast bowler James Anderson is England’s all-time greatest cricketer, according to retiring batsman Alastair Cook. Anderson overtook Glenn McGrath as the most successful fast bowler in Tests with the final wicket of England’s fifth-Test victory over India. “He’s an incredible athlete, an incredible bowler,” Cook told Test Match Special. Anderson bowled Mohammed Shami to claim his 564th Test wicket and go one ahead of Australia legend McGrath. The 36-year-old sits fourth on all-time list of Test wicket-takers, behind three spinners – Muttiah Muralitharan, Shane Warne and Anil Kumble. The Lancashire man, who made his debut in 2003, has played 143 Tests and delivered 31,500 balls in that time – more than any other fast bowler in the longest form of the game. “I can’t describe what he must go through, physically and mentally, to do what he does,” added Cook, who captained Anderson in 49 Tests. In the fifth Test at The Oval, Anderson became the oldest pace bowler to open the bowling for England for 22 years. He has previously said he wants to play on until the home Ashes series of 2019, but now says he will “keep going as long as possible”. “When we come into a series like this, with five Tests in six weeks, there’s always that question mark over bowlers, especially bowlers that are over the age of 35,” said Anderson. “I feel pretty fresh considering how many overs I’ve bowled. I’m thoroughly enjoying playing. As long as I keep my fitness in a good place, as long as I keeping enjoying turning up to practice and working on my skills, I’ll keep going. An emotional Anderson also revealed how much he will miss his “good mate” Cook, who is leaving the international game after a 12-year career. “He’s helped me through a lot of my career,” said Anderson, who played in 130 of Cook’s 161 Tests. The 118-run victory at The Oval gave England a 4-1 series triumph over the world’s number-one ranked Test side. That followed a winter in which they failed to win any of their seven Tests in Australia and New Zealand and a beginning to the home summer that saw a 1-1 draw with Pakistan. “It’s been an amazing series, one of the best I’ve been a part of,” said Anderson. “It’s been quite close in a lot of games and we’ve been up against it quite a lot. It’s been hard graft. Anderson’s passing of McGrath came after Cook, England’s leading Test run-scorer, marked his final match with a century. In an emotional week in south London, the Essex man received numerous standing ovations and led the England team from the field as he left the Test arena for the last time. On the void left by Cook, Root added: “It’s a great opportunity for someone to come in, play in their own way and make that spot their own. Next Story → How Anderson became the world's best – and is he getting better?